Home / SkinCare / NeoCorium Clinical-grade EGF & Stem Cell Facial Treatment. NeoCorium Clinical-grade EGF & Stem Cell Facial Treatment. The NeoCorium Clinical-grade EGF & Stem Cell Facial Treatment is a powerful EGF skin therapy treatment for rejuvenating, detoxifying and restoring skin to its optimum health. The at home treatment arrives with all-natural epidermal growth factors, essential amino acids, phospholipids & glycosaminoglycans in an ultra-concentrated formula to give you back your best skin. NeoCorium’s clinical-grade skin therapy treatment is an all-natural blend of powerful active growth factors and stem cell concentrate. This nutrient-dense formula feeds your skin nourishing ceramides, proteins and minerals to intensely hydrate and stimulate the production of collagen and elastin. Skin is revived and strengthened, whilst acting resilient against the effects of aging. Repair damaged skin due to the effects of aging and environmental aggressors. Rebuild new, fresh, healthy skin that resists wrinkling, sagging and thinning. Restore luminosity, volume and elasticity in tired, aging skin. Returns youthful response- skin looks and acts younger. NeoCorium's EGF therapy rebuilds healthy skin with epidermal growth factors, transforming growth factors and stem cells. Vital amino acids, phospholipids and glycosaminoglycans deliver and hold moisture in the deepest layers of the skin. Skin’s structure is not only maintained, but strengthened and can defend against oxidation and breakdown from aging and environmental stress. Developed with 71 highly potent, all-natural actives in NeoCorium’s breakthrough formula harness the power of in-office invasive procedures in a non-invasive, topical treatment. NeoCorium works to smooth expression lines, lift and firm skin and reduce wrinkling and creasing. Recover your youth and reveal your best skin. Emu Oil, Jojoba Oil, Lavender Oil. Epidermal growth factor, Fibroblast growth factor, Platelet-derived growth factor, Erythropoietin, Transforming growth factors alpha & beta, Interleukins, Insulin-like growth factors 1 & 2. 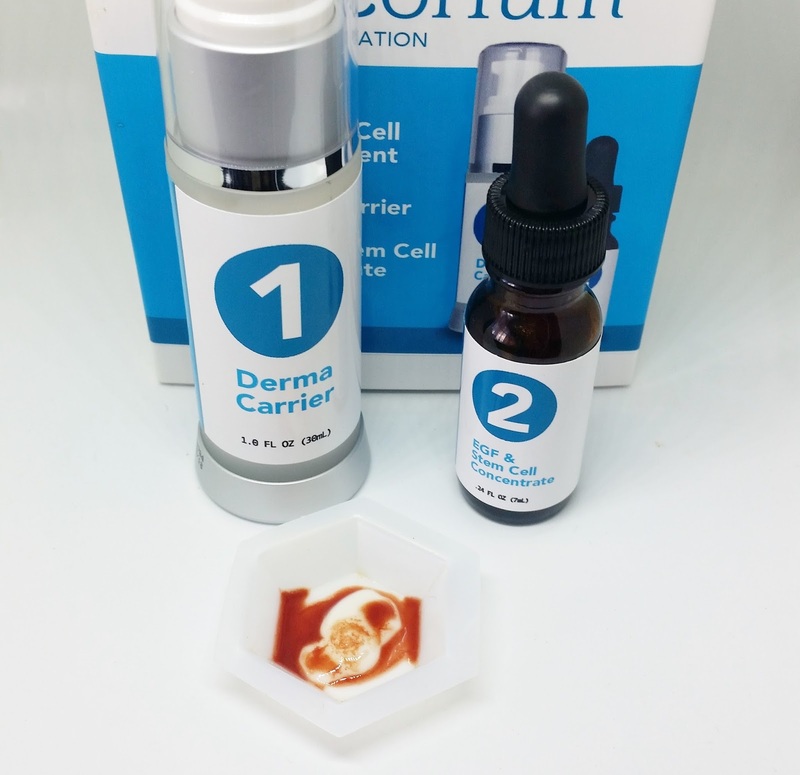 When To Apply NeoCorium Clinical-grade EGF & Stem Cell Facial Treatment? Skin repairs itself at night, so this is the best time to apply the NeoCorium facial treatment allowing the product to be at its most effective. 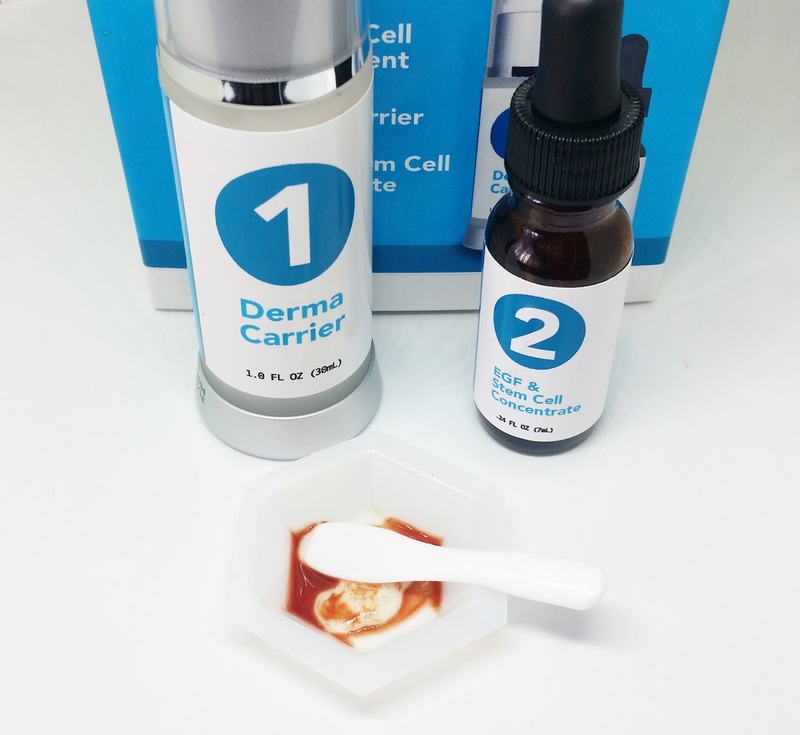 After you have cleansed your skin, then u can proceed to mix 4 pumps of the derma carrier with 3 drops of the stem cell concentrate in the little mixing dish provided. You must only use the NeoCorium Facial Treatment on your face, no other products should be used as the treatment addresses multiple skin issues such as, hydrate, repair, and rebuild healthy skin at cellular level. The bottles are clearly marked with their names and with 1 and 2 on the front label, so u know how to dispense each product. 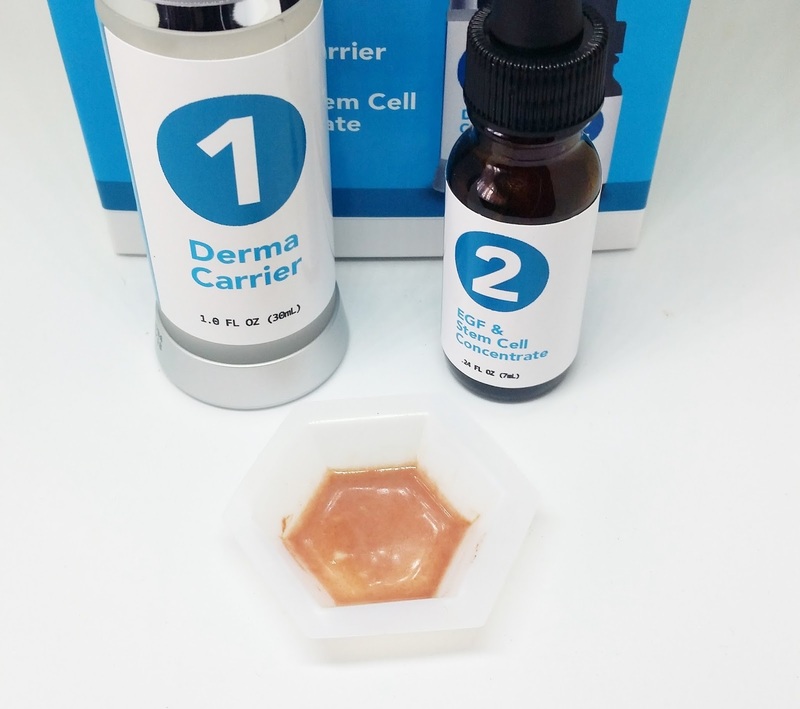 The derma carrier is a white runny consistency and when dispensed the lavender oil takes over your senses. The stem cell concentrate is red in colour which makes a nice change from applying a clear or white coloured product, Mixing both products in the dish provided, i chose to use a little mask spatula (i had spare) as no mixing tool arrives with the kit. You could use a spare brush, or just use your finger as both products mix really easily together. Applying a little to the face, the NeoCorium facial treatment glides over skin with ease and with little effort the treatment is absorbed into the skin quickly. I made sure i covered all of my face and then went over the skin again with the remainder of the treatment present in the mixing dish. My skin felt instantly hydrated thanks to the ingredients of the derma carrier and the lavender scent helps you relax, great for using the facial treatment at night before bed. I did experience some firmness and a little tightness about 20 minutes after it was applied and awoke to a more uniformed and refreshed complexion in the morning! What i like about the NeoCorium Clinical-grade EGF & Stem Cell Facial Treatment, it adapts to your own skin needs, whilst your only applying one product to see and feel the results. An easy-to-use and easy-to-follow night time skincare regime, find out more at NeoCorium, X Neil.